Most Desirable Actors: Jackie Chan, Chow Yun-Fat, Andy Lau, Stephen Chow, Tony Leung (Chiu Wai). 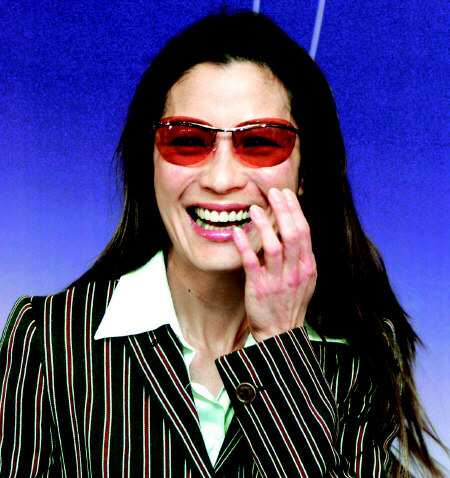 Most Desirable Actresses: Michelle Yeoh, Maggie Cheung, Sammi Cheng, Miriam Yeung, Sylvia Chang. Most Desirable Directors: John Woo, Jackie Chan, Johnny To, Peter Chan, Ann Hui, Wong Kar Wai, Derek Yee, Stephen Chow, Tsui Hark and Stanley Kwan. - The message borad - open for everyone - is up at The Touch Official Site. 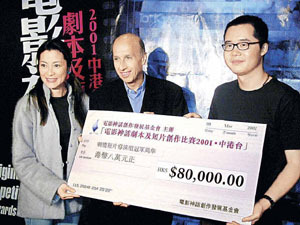 - Action film director John Woo (Face Off, Mission: Impossible 2, The Killer) was promoting his new release Windtalkers in Hong Kong and received an honorary fellowship from the Hong Kong Academy for Performing Arts on June 25. At the interview after the ceremony, he told reporters that one of his future film plans is a Hong Kong/US cop film, for which he hopes to get Michelle to star the Hong Kong cop. Woo's next film, Land of Destiny, which teams Chow Yun-fat and Nicolas Cage, is planned to start this fall. - A new poll has been set up at the left side of this page. I'm setting it in order to collect some information for Thomas Chung - yep, Thomas Chung the co-producer of The Touch, who would like to know how many people are interested in music and video clips on the official site. More responds he gets, more clips he will put. So, why wait - GO VOTE! - The release date of The Touch is postponed to August 17 in Taiwan . - The survey poll (see news on June 15) on sending birthday wishes to Michelle is closed. Since we've already got 60 people who voted "Yes", I'm going to set up the form. Keep tuned! [Tianjin Daily] An official from the China Co-Production Corp confirmed that they have received three "Mulan" film proposals for approval - from Michelle's company, Stanley Tong's company and a South Korean film company respectively. Which Mulan(s) will get approved to be allowed to shoot in China? The answer is in the air until officials finish reading and discussing the submitted scripts. A Chinese producer told reporters that he wishes all three of them get approved and we will see which one will be the best. 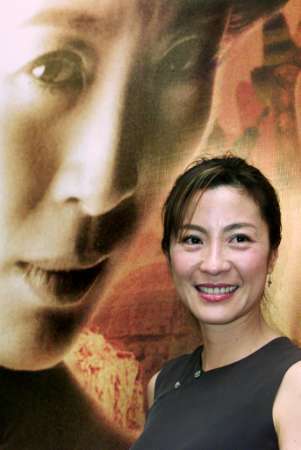 "I personally favor Michelle Yeoh," he said, "she is the ideal person to portray Hua Mulan. If her company's project is turned down, other companies should get her to their Mulan films." Stanley Tong's Mulan film is to be on $25 million budget (not $80 million as previously reported by Variety). Produced by Tong's own company, it's planned to be shot in English and get an overseas actress as the female lead. The Korean one is to star Korean actress Kim Hee Sun, who is called "No.1 Korean beauty" by the media. - Michelle didn't attend the closing ceremony of Shanghai International Film Festival (16th). International Daily News (North America) reported Michelle didn't feel very well physically. Audience in Shanghai will have chance to see her in early August when she promotes The Touch there. As we know, Michelle's birthday is coming soon. I've received some suggestions on what we can do for Michelle for her special day. One of the options is to collect birthday wishes from our fans and I then send them to Michelle prior her birthday. I'd like to know how many people like this idea. A survey poll has been set up at the left side of this page. May I take two seconds from you and ask you to answer the survey? If there are enough interests, I'll set up a special page/form for it. One vote per person, please. - CCTV (China): The distribution contract of The Touch for Mainland China was signed yesterday in Guangzhou. The film will be released in Mainland China in late July, same as in Hong Kong and Taiwan. A press conference was held at June 10th in Guangzhou. For more detailed report and photos please see The Touch news. Photo at left: Michelle in Guangzhou (Yangcheng). - Michelle will attend the closing ceremony of Shanghai International Film Festival which will be held on June 16th. She's invited to be an award presenter. - New at The Touch Official Site: Set Design. Written and photographed by the Art Director Second Chan. - New in Trailers & Clips: Yes Madam HKL trailer, original trailer of Project S and the fight with the "giant". Thanks to BAM! - Screen Daily reported The Touch was sold to Italia Film for the Middle East and Central Partnership for Russia on Cannes market. - Now for some fun reading - scroll down to the end part of this Calgary Sun article. ;-D !!! 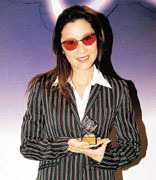 - Michelle accepted the 2002 international Montblanc Arts Patronage Award for her achievement in arts and her contribution to the film world, on June 5th, Hong Kong. "It is an honor and encouragement for me. Even without this award I'll do my best in the film development. I don't simply consider this is a work - I really love filmmaking," said Michelle. On the ceremony, Michelle's friend Pansy Ho presented the award and made a speech. Pre-recorded videos from Anita Mui, Mabel Cheung, and Peter Pau were shown. They congratulated Michelle and expressed their admiration for her, saying she is strong-willed, talented, hard worker. She devotes herself to the arts, giving no thought to personal fame and gain. 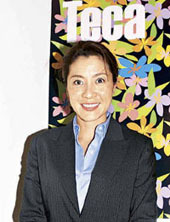 Anita Mui said Michelle is the pride of women. The Montblanc Art Patronage Award is conferred on outstanding art patrons whose personal commitment and achievements deserve wider recognition. Michelle is the third person from Hong Kong who received this award, after Jackie Chan and Pak Suet-Sin (Bai Xuexian). Michelle said the EUR$15,000 award would go to the "Mythical Films Creative Development Fund". - Michelle is awarded at the international Montblanc Arts Patronage Award. She will accept the award at June 5th, Hong Kong. Congratulations, Michelle! - On The Touch Official Site: two screensavers and two new wallpapers. A treasure hunt game with a chance of winning some prizes is coming on June 3rd (Hong Kong residents only. Hmm... ). Future show times: May 30, 10 a.m.; May 31, 2 p.m.; June 1, 9 a.m., 7 p.m.; June 2, 10 a.m., 3 p.m.; June 3, 2 a.m., 9 a.m., 2 p.m; June 9, 9 a.m.
- Crouching Tiger, Hidden Dragon video game, which will not hit market until November, was demonstrated at the Ubi Soft Entertainment booth at the Electronic Entertainment Expo, the Los Angeles Convention Center, May 23. - The dispute between Han Entertainment and French distributor M6/SND over The Touch continues. See report from Screen Daily. - [From Cannes] People Daily published an exclusive interview of Michelle, which took place in a hotel at Cannes. The reporter asked Michelle about her work as a Cannes jury member, her opinions on Cannes, Berlin and Venice film festivals, and her standard of judging films, etc.. The following are some selected parts from the interview. Reporter: As a jury member you will see a lot of films on the festival. Is it helpful for increasing your knowledge on films? How does it affect your future career? Yeoh: In fact, ordinary audience can also see all the films we jury members see. The difference is, as a jury member, I need to think more. This is my first time on Cannes jury and it gives me an excellent learning opportunity. The jury head David Lynch is a director I admire very much. Many other jury members are also very talented filmmakers. We have our heavy duties as jury members. But communications among us are sincere, and also fun. By discussing with them I've learned a lot of things which I couldn't learn during making my own films. They are all very nice toward me, treating me like a younger sister. Sharon Stone said to me yesterday: "Hi, Michelle, you are the youngest jury member among us." I think this is an encouragement. Reporter: After TOMORROW NEVER DIES, many people thought you would go to Hollywood. But it didn't look true? Yeoh: After the Bond film TOMORROW NEVER DIES, my cooperation with Hollywood has not been stopped. I then made CROUCHING TIGER, HIDDEN DRAGON with Ang Lee. I was not eager to star in another Hollywood film immediately. Someone may think Asian actresses are so interested in going to Hollywood that they would grab every opportunity. We should realize that the space Hollywood provides to an actor is much wider than to an actress. If a good role comes by, of course I will continue to work with them. Reporter: You are named "Asian Action Queen" in the movie world. Do you have real kung-fu skills? - Michelle is doing hard work as well as having good time at Cannes. According to Hong Kong news sources, She's going to continue the preparation on Hua Mulan after finishing the festival. The script is almost ready and waiting for Chinese official's approval. As soon as this is done, the production can start. The scenes to be shot (in China) will include scenes of frozen Yellow River and snow mountains, which will have to be shot at the coldest time and the coldest region of China. - [From Cannes] Michelle attended the amFAR (American Foundation for AIDS Research) gala, an annual AIDS benefit during Cannes Film Festival, in Mougins, near Cannes. Guests at the exclusive event included movie stars Elizabeth Taylor, Sharon Stone, director and Jury head David Lynch, and Miramax executive Harvey Weinstein. - "The Hollywood Reporter" (May 20) has a report on the problem between Han Entertainment and the French distributor over The Touch: Han, SND mired in 'Touch'-y spat over Yeoh movie . Han's director Thomas Chung is meeting with Miramax co-chairman Harvey Weinstein this week in Cannes to discuss the U.S. release for The Touch. - [From Cannes] This year's "Hong Kong Night" in Cannes was held at Carlton Hotel beach, evening of 18th. It is organized by the Hong Kong Trade Development Council as a part of "International Route of Hong Kong Films" exhibition which lasts from May 18th to 25th at Cannes. The main theme of the night was "New Montage From the East". Michelle attended the event and accepted interviews - nonstop, according to Chinese reports. 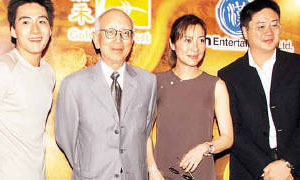 Other Hong Kong filmmakers participated were Maggie Cheung, Tony Leung Chiu Wai, Tony Leung Kar Fai, Stanley Tong, Mabel Cheung, Stanley Kwan, etc.. More than 2000 guests came to the event. - "As an actress and as a juror there is pressure in different ways. It gives me the perfect opportunity to not only view and have my fingertips on the pulse of what's happening globally. As an actress you come for very selfish reasons, I want my movie to do well. I want the best possible publicity for it. This time is different because I want everybody's film to do well. And it's going to be hard work, because you know how much love and pain and time and effort goes into a film, but it appeals in different ways to different audiences So who am I to say 'This is the best film?' I think every filmmaker who is here, in competition and out of competition, are winners themselves." - Michelle's upcoming The Touch is listed by "The Hollywood Reporter" (Cannes Special Issue, May 2002) on its annual The A-List: the ten debut films that will create buzz in Cannes. On the same issue there is also a full page of The Touch poster. - [UDN report from Cannes] Michelle arrived at Cannes on 13th and joined other jury members for a meeting in the morning of 14th. The first jury press will be held at 15th. Being a jury member of the festival, Michelle is expected to be busy and she may not talk to public unless arranged by the festival. Also arrived at Cannes at the same time were Thomas Chung and other people from Han Entertainment. Their task is to promote The Touch and look for international buyers for The Touch sequel and Hua Mulan. The 55th Cannes international film festival runs from May 15 - May 26. - Two videos of Searching for Young Michelle Press (August 2001) are added at The Touch. * at The Touch page: an official poster (in Posters section) and a new title picture. * at Official Site: a tribute to Long Sihung. - A news conference and the signing ceremony between Golden Harvest and Han Entertainment for co-distribution rights of the film The Touch for Hong Kong, Singapore and Malaysia were held in Hong Kong on May 8. 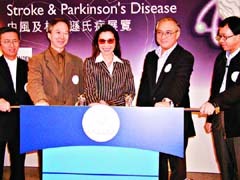 Attendants included Michelle, Thomas Chung, Brandon Chang, and the chairman of Golden Harvest, Raymond Chow. The film is currently in post-production and will be released in Hong Kong and across South East Asia on July 26. The Touch is a tale of myths surrounding ancient treasure and family whom is destined to retrieve it. For more reports and photos see The Touch page. - Hollywood Reporter: Golden Harvest Entertainment has acquired theatrical distribution rights for The Touch for Hong Kong, Singapore and Malaysia. The film is expected to be released July 26 in Asia. No date has been set for its U.S. release, which will be handled by Miramax. - The second part of Michelle's diary, My Days in Dun Huang, is up at The Touch Official Site ("Making The Movie - Story of Dunhuang"). 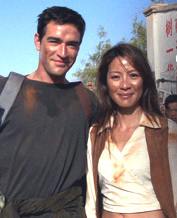 Photo taken from the Official Site: Michelle and Ben Chaplin at Dunhuang. - The Touch update: Hong Kong singer Kelly Chen will perform the title song for the film. - Famous Taiwanese actor Long Sihung passed away at the morning of May 2nd, in a Taipei hospital due to his worsened heart, kidney and liver diseases. He was 72. Long Sihung is known to many people for his Sir Te role in Crouching Tiger, Hidden Dragon. He is also famous as the father figures in Ang Lee's other three films: Pushing Hands, The Wedding Banquet and Eat Drink Man Woman. Long Sihung had appeared in over 100 films and he was awarded best actor and best supporting actor at the Golden Horse Awards for his roles in Pushing Hands and The Wedding Banquet respectively. Sadly, the upcoming The Touch becomes his last film. For more detailed report and some photos on Long Sihung in The Touch please see The Touch News. According to Chung, The Touch is expected to be shown in China this August. A sequel to the film is currently under development. - A cool Michiana Chronicles report on the International Conference on Globalization and Media in Asia at University of Notre Dame (February 28 - March 2): Notre Dame Welcomes the Queen of Cool. For larger versions and more photos see 1 (thanks yeohfanz.com) and 2 (scroll down). For earlier report/links of the event see News of March. 12th. - Screen Daily: Fortissimo to handle remaining sales on Pau's The Touch. According to the article, Fortissimo Film Sales is going to handle The Touch distributions in outstanding territories including Japan, Korea, Germany, Scandinavia and East Europe. The film was pre-sold to Miramax for the US, UK and Italy and a number of other territories. But French M6, which committed to the French rights of the film, is having problem with the negotiation. The Touch is to be released in Hong Kong on July 22. - The first part of Diary of Michelle - My Journey on "The Touch" is published at The Touch Official Site: Making The Movie - Story of Tibet. It describes in details her days in Tibet during The Touch shooting. - Michelle will be on the jury of this year's Cannes film festival, which runs from May 15-26. The official festival program is scheduled to be unveiled on April 24. - According to Oriental Daily (Hong Kong), Taiwanese singer Sherry Chang and Hong Kong singer Kelly Chen are being considered to perform the title song of The Touch. Brandon Chang, who's also talented in singing, may join one or both of them in the performance. Photo from Oriental Daily: Michelle and Brandon Chang in The Touch. - A short (but informative) article from TV Guide. Ben Chaplin talks about The Touch. The article says the film is slated for release in late 2002 or early 2003 (thanks Yvonne). - One more MAXIM photo is added at April 11's news. 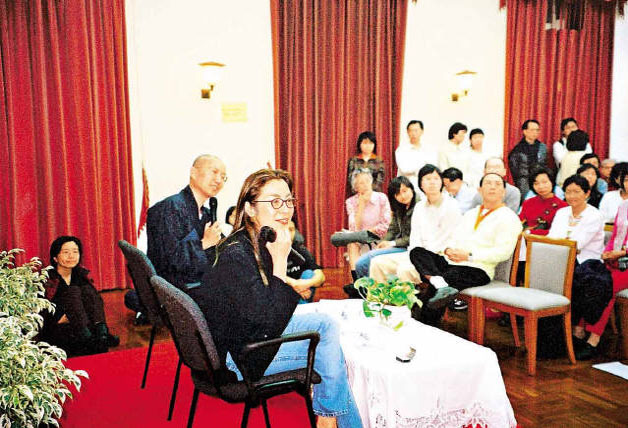 - On 11th, Michelle attended the talk series at Hong Kong University, "Direction of Life", co-organized by the Centre of Buddhist Studies and the Buddhist Studies Society. Sharing her experience and view of the life, she gave a talk entitled "An Understanding Smile" as a guest speaker. It was the last talk in the six-talk series which started in February. Photos from Sing Pao (click to enlarge). - In Event Photos: Exclusive photos from an interview with Michelle at Beverly Hills, July 1996 when Supercop was released. Provided by Akiko Tetsuya, who was one of the interviewers. Thanks, Akiko! - More videos in Trailers & Clips: One of Michelle's cameo fight demonstrations from Twinkle Twinkle Lucky Stars (1985). It's recorded from a documentary video and it's silent. Also a short clip (00:14)which has only Michelle related part from the The Owl vs Dumbo trailer (thanks again to BAM). It has been quiet with Michelle news lately... The latest report on Michelle I saw was when she went to watch Zhang Yimou's new ballet show , "Raise the Red Lantern", on March 17 in Hong Kong (pic from Sing Pao). - A trailer of The Owl vs Dumbo (thanks to BAM!). It is Michelle's very first movie (1984) and she has a non-action role. The trailer has less than five seconds of Michelle (at 2:43 - 2:47). - Three more video clips from The Touch Beijing Press Conference (December 5, 2001) by NetandTV.com. For details and download links see The Touch page (thanks MonkeyPeaches). [updated 04/08] Final result of the poll: total 406 votes. Michelle 304 votes (75%). Stanley Tong 102 votes (25%). - Frida has encoded some videos from Taiwan: CTHD Taiwan Premiere and Press Conference (July 2000), and Golden Horse's best actress award (Michelle was nominated and attended the awards, December 2000). The download links are at Frida's site. The titles are in both Chinese and English. All videos are in Mandarin. Yep, Michelle did speak Mandarin at the press conference. Some of the clips are rather large. You may try Download Accelerator, which BAM recommended to me and I found it's very helpful and easy to use. It speeds up downloading and has a resume feature in case of interruption of the downloading. - A SCMP article today talks about a new era in Hong Kong and Chinese cinema, with a focus on Michelle's The Touch, Zhang Yimou's Hero and Jackie Chan's Highbinders (thanks to Tim). - There's a rapper named Arnie Sykes who sings a song called "Michelle". It's not for our Michelle only but it mentions Michelle Yeoh in the song. You can download the song from Arnie Sykes (original message posted at Yahoo!Group). There was a song, "Kung-Fu Girls", written for our Michelle in year 1999 by Kung-Fu Grip. If you haven't, you can listen to the song by following the link at Links -> Special for Michelle. - Here is a good news for anyone who's trying to get Tai Seng's Wing Chun DVD - CD Universe has it in stock for $15.96 (thanks to BAM for information). - New: Making of Crouching Tiger, Hidden Dragon and Behind Scene Photos. Most of the photos are scanned from various documentary videos and a photo book (thanks Akiko!). - Some (not new) interviews/articles are added in Links. - After attending American Film Market last month in U.S., Michelle attended the International Conference on Globalization and Media in Asia held at University of Notre Dame (February 28 - March 2): "Hollywood, Asian Media and the Global Market". The conference was sponsored by 20 University programs and organizations. "The unique thing about this conference is the combination of the leading scholars and also the leading figures in the entertainment world," reported 'The Indianapolis Star' (a major Indiana newspaper), "One of the event's participants is actress/producer Michelle Yeoh, ...". Michelle made headlines in the conference news. She was one of the speakers at the panel discussion "Martial Arts and Global Entertainment". 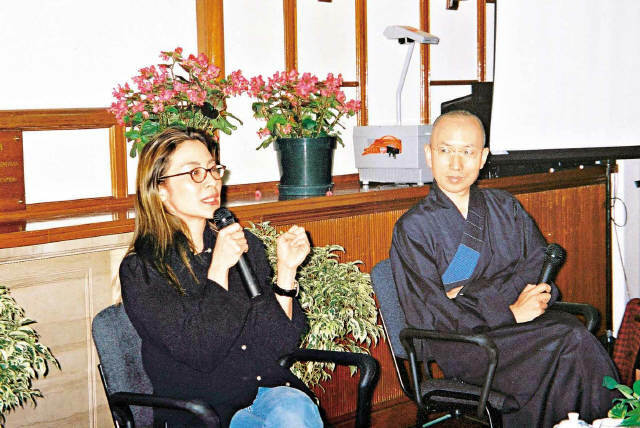 Two of her films, Wing Chun and Crouching Tiger, Hidden Dragon, were screened during the conference. A special discussion session with Michelle closed up the conference. - The award ceremony of 2001 Mythical Films' Original Scripts and Short Films Competition was held on March 11th, Hong Kong. As an organizer, sponsor, and chairperson of the competition, Michelle presented the awards to the winners from Mainland China, Hong Kong and Taiwan. More than 50 reporters from different regions attended the ceremony and Michelle answered their questions in Cantonese, Mandarin, and English. Michelle says this is a good way to discover and encourage new talents in Chinese film industry and there will be more of such competitions, possibly every other year. Winners will be offered film contracts but they are not restricted to Mythical Films. Michelle hopes these new talents will be noticed by more people and have more space to develop themselves. (see earlier news at Nov 28 2001 for the competition result). On last Sunday Britain's "Sunday Express", Michelle was listed as one of "the world's 300 most beautiful women". When asked about this, Michelle said she never counted herself as beautiful looking. "There are plenty of beautiful looking women in this world. But I think the most important is the inner beauty and if you live happily," said Michelle. In her eyes, Michelle thinks her mother is the most beautiful woman. "My mother is beautiful and she has character. When I look at a woman, I look for her character. A woman is attractive when she has character and brain." She thinks actress Jodie Foster is one of such women. Asked about women in Hong Kong, Michelle says she admires Anson Chan, a former Chief Secretary for Administration. Right now Michelle is working on the post-production of The Touch. Three other movies are also in development. She confirmed one of the three is Hua Mulan, which will star Michelle herself. Michelle says it's her wish to make this film because this role is so perfect - Mulan is a person who is loyal, faithful and devoted to her family, country, and love. Photos below from Oriental Daily & Sun: Michelle at the award ceremony. 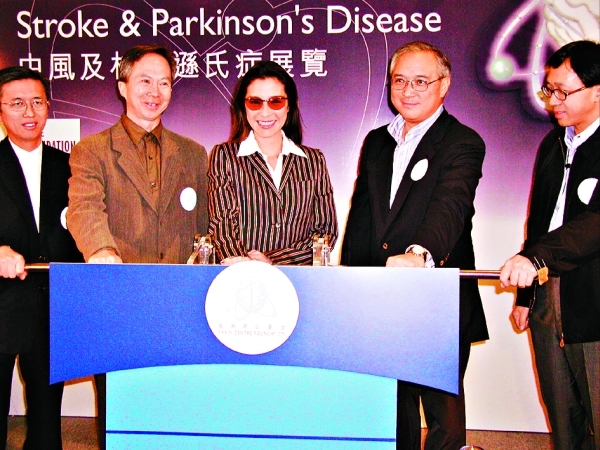 - On March 9th, Michelle, who just returned to Hong Kong from Los Angeles, attended the Opening Ceremony of the Brain Centre Foundation Exhibition for Stroke & Parkinson's Disease in Hong Kong. She is an honored sponsor of the foundation. Photos from UDN, Sing Pao & Hong Kong Daily (click to enlarge). (Oriental Daily) - Oriental Daily (Hong Kong): After The Touch, Thomas Chung and Michelle's Han Entertainment is planning three major productions on a total budget of $70 millions: Hua Mulan, The Touch sequel, and a vampire movie entitled Jiang Shi 2002 ("jiang shi" means "vampire" in Chinese). Michelle's disciple, Brandon Chang, will have major roles in all three films. Starting soon this year, Jiang Shi 2002 is written by Courtiaud and Carbon, who are also the script writers for The Touch. Being a horror film lover herself, Michelle is a producer of the film. Besides Brandon Chang, Hong Kong actor Stephen Fung may star in it too. The film will be shot in English. - According to UDN news (Taiwan), Hsu Li-Kong, a producer of Crouching Tiger, Hidden Dragon and its upcoming prequel, is planning to introduce a Mainland Chinese actress Zhou Xun (Suzhou River) to director Ang Lee for a role in the prequel: Precious Sword, Golden Hairpin. (photo from the official site) - The Official site of The Touch has had a major update: new photos, character descriptions, wallpaper, etc.. According to UDN news, Sherry Chang will perform the title song of The Touch, "Himalayas". The same song is also sung by Margaret Wang in a scene of the film. - Taiwan UDN news has a small report on The Touch today. No new news but there are two photos from the shooting set. - Crouching Tiger, Hidden Dragon won the Best Score Soundtrack Album for a Motion Picture, Television or Other Visual Media at the 44th annual Grammy Awards. - Collision of Mulan films? Today's Variety and Entertainment Wire reports mentioned that a $80 million film, The Legend of Mulan, will be in production. The Hollywood production will be in English and shot in China. Stanley Tong (Supercop, Rumble in the Bronx) will be the director and Chang Chen (Crouching Tiger, Hidden Dragon) plays the male lead. I don't khow how accurate it is... early this month I read from Taiwan/Hong Kong news that Stanley Tong is making an English-language Mulan movie. The female lead is said to be Chinese American and the production is scheduled to start in October. The interview of Michelle was done on a shooting set inside the Beijing Film Studios. - Two new drawings of Michelle by Cory are in Gallery->Art Work. Thanks, Cory! - Some additional photos in "Michelle and Her Wax Double" and "Datuk Yeoh's Title Ceremony". See Gallery->Event Photos. - Re-scanned all pictures for The Soong Sisters. Included some scenes which are cut off from some video/DVDs (e.g. 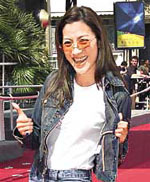 Mei Ah DVD). Also a new title picture and some additional photos in Other Pictures. Show Name and Channel: "Women of Action", E! It is an appeal to Disney, in particular, the subsidiaries in question, Miramax and Dimension Films, to cease the act of altering Hong Kong films (changing music scores and original dialogues, cutting scenes, changing titles, etc.) that they distribute. I personally agree with what this petition says. If you can spare a moment, you may want to take a look, and consider signing yourself. Miramax has acquired the distribution rights for North America to Michelle's upcoming film The Touch. And recently you may have noticed from some Hong Kong DVD/Video dealers in North America that some Hong Kong film titles are discontinued and no longer available. Disney now owns the exclusive North American distribution rights for such films as The Heroic Trio, Executioners, Police Story III: Supercop, Yes Madam, Easy Money, Wonder Seven, and Ah Kam (and possibly Wing Chun - the last one is unconfirmed). Disney owns the rights to all versions of the films; and it is up to Disney when and how they release (if they do, in any format) these films. According to the contract, it is a violation of United States law for any other North America-based company to sell these titles. - If you have been looking for purchasing Wing Chun DVD: Tai Seng's DVD seems discontinued but you can get one from different distributor. See HKFlicks.com. It's English subtitled and all region. - BAM has encoded the teaser trailer of The Touch in Avi and Rm format (with much smaller file size). See links at The Touch page. He has also enhanced Frida's clip of Michelle's Malaysia tourism ad and encoded it into different versions. See Video Download. Thanks - Frida and BAM! - "This is my real hometown - Malaysia". - "This is Malaysia, where the charm of Asia lies". - Crouching Tiger Prequel may start production at May, 2003! Taiwan news (CNA, UDN): Ang Lee's new movie The Hulk will start shooting in March. At a recent meeting of Ang Lee, Hsu Li-Kong (a producer of CTHD), and some people from Columbia, Ang Lee announced that his schedule will allow him to start shooting Crouching Tiger prequel at May 2003. This news excited all CTHD filmmakers. Now with Ang Lee's schedule clearing up, the most important thing is the script. The casting can't be done until the script is completed. The prequel is expected to display the classical Chinese art style, also the spirit of traditional Wuxia and the characters of martial arts. Ang Lee insists the next film should keep the classical flavor from the original one, and it should also have new ideas in the structure. Hsu Li-Kong says no cast has been fixed yet. They will have to see the script first and also consider the schedules of the actors and the international marketing. Jet Li, who missed his chance in the first film, may still be considered in this one. - At the recent 2002 MTV Asia Awards, Crouching Tiger, Hidden Dragon was still honored as the Favorite Film, a year and half after its original release. - Filming of The Touch has been successfully completed. See The Touch news for more details. 1. Michelle at the Channel V's 8th Best of Best World Chinese Music Awards. In Mandarin (1 min 02 sec, 5.2MB). 2. A teaser trailer of The Touch! Michelle showed it at the Channel V's music award. It has some cuts same as the trailers shown at the Beijing Press Conference in December. In English (1 min 16 sec, 6.4MB). - More from Michelle fans: Kityi, joined with Aythe, redesigned her website and opened it at a new location yeohfanz.com. Great site! Also MYOFC (Michelle Yeoh Online Fan Club, by Dean and Angela) is re-opened at michelle-yeoh.org. It's still under construction but the news and message board sections are up, and the newsletters have been sent periodically to its members. The direct links to their News can been seen at the left of this page. - Photo: Michelle visiting the Gleneagles Medical Centre paediatric ward in Penang (Feb 1). - According to news from Malaysia, Michelle is currently in Penang, Malaysia. The last two days of shooting for The Touch will take place there and the entire shooting will wrap up on Feb 3rd. More details please see The Touch news. 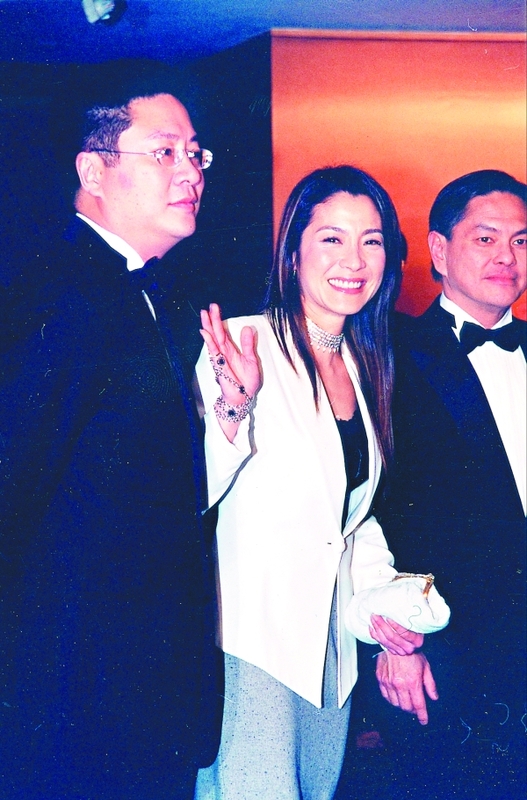 - On Jan. 30th, Hong Kong's 2001 Leaders of the Year Awards, in recognition of outstanding contributions to HKSAR's success and prosperity, were held at Grand Hyatt Hotel. Michelle attended the ceremony as an award presenter. When asked if her goal is to be a future award winner, Michelle smiled and says she will try her best to do what she does. Michelle had been very busy recently with the post-production of The Touch. They have to finish the cutting before they could show it to the composer. Michelle told reporters she will have to spend the Chinese New Year in U.S., mainly to work with the composer and also to attend the American Film Market. When asked if the film exceeded its budget, Michelle admitted it's tight but she's making sure it's under control. Also attended the awards, Thomas Chung, the co-producer of The Touch and Hua Mulan, told reporters that The Touch will hit theaters in Asia this summer. Hua Mulan is scheduled to start shooting by the end of the year and the budget is about HK$300 million. 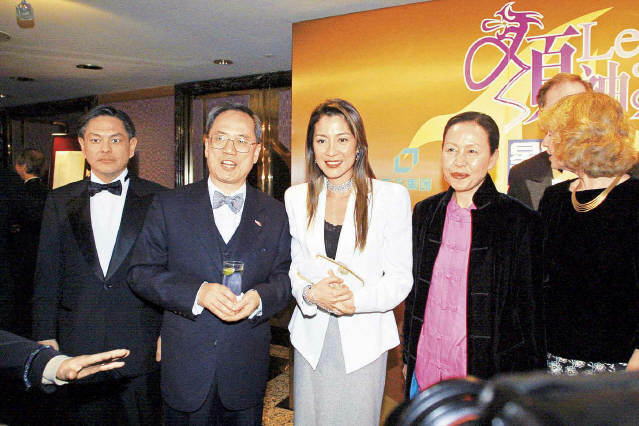 Photo at right (Ming Pao): Michelle met with Mr. Donald Tsang, the Chief Secretary for Administration. from StareastNet: with Mr. Donald Tsang at the gala banquet. - On the music awards of 25th, in additional to the Most Welcomed Female Singer Award, Michelle also presented the Most Welcomed Male Singer Award, to Jay Chow. - The largest annual music event in Asia, the 8th Best of Best World Chinese Music Awards, were held on 25th at the Beijing Sports Center. About 20,000 people attended. 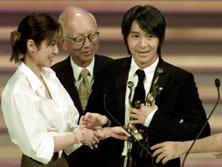 According to UDN News, the first climax of the ceremony was the Most Welcomed Female Singer Award, given to Faye Wong by Michelle. Michelle, who first time presented a music award, said: "I've just finished the shooting of the movie THE TOUCH. It is my 19th time as a female lead. As for singing, I think I will just pass." Faye Wong then performed her award winning song 'Flowing Years'. Photo at left: Michelle at the award press conference (Munsang Poh. Click to enlarge). - A great report from SCMP on The Touch shooting. Goodness re 52 takes on one shot! - Michelle is going to attend Channel V's the 8th Best of Best World Chinese Music Awards. She's invited to be an award presenter. It will be the first time for Michelle as a presenter on music awards. Michelle says she's not very familiar with Chinese (Mandarin) songs. Her favorite Chinese singers are Anita Mui and Jacky Cheung. When asked if she ever plans to publish her own album, Michelle started laughing: "Maybe you wouldn't ask me this question if you heard my singing before!" The ceremony will be held on January 25th in Beijing. - A collection of "World Tour" photos of Crouching Tiger, Hidden Dragon: premieres, press conferences and award ceremonies. The link can be seen at CTHD page or Gallery -> Event Photos. Taiwanese news says Michelle is going to be at the 2002 American Film Market (February 20 - 27) to promote The Touch. - According to UDN news from Taiwan, the shooting of The Touch in Beijing was wrapped up on 12th. Now Michelle and Thomas Chung are also eyeing on their next film Hua Mulan. Later this month, they are going to meet with the script writer Wang Hui-Ling, who has finished collecting materials and had the structure of the story ready. The actual writing will start very soon. Hua Mulan is going to be a film of combination of action, family ties, romance, and humor. Some big action scenes include army battles in snow and chained-boat burning on Yangtse River. The shooting is scheduled to start in December this year in China. The film will be shot in Mandarin. - One more picture is added on Jan. 10th The Touch news. - The production of The Touch is going to finish by Jan. 12 in Beijing. For more details and some production photos see The Touch news. - Well, it looks like we will not be able to see Wai Lin returning in the upcoming Bond 20. See report from Commander Bond. - Tan Dun, the composer of Crouching Tiger, Hidden Dragon, got 4 nominations at the 44th Annual Grammy Awards. Three of his nominations are for the film: Best Score Soundtrack Album, Best Song (A Love Before Time) and Best Instrumental Composition (The Eternal Vow). - Tianjin Daily today published an article about Hsu Li-Kong, a producer of Crouching Tiger, Hidden Dragon. Hsu talked about the Crouching Tiger and its prequel. When producing Crouching Tiger, Ang Lee and Hsu Li-Kong put all they had on the film. Hsu said: We were forced into the situation. Because of the fall of the stock market, the original investing company withdrew. Columbia invested 6 millions. The rest of the money came from the sales of the distribution rights and loans from an U.S. bank. Ang Lee and both male and female leads didn't take their paychecks but invested the money on the film instead. Later the film had more than 100 million boxoffice. But Ang Lee's paycheck was only $200,000. Hsu says Ang Lee now becomes a famous international director and he doesn't know Lee's current price. Talking about the prequel, Hsu says Ang Lee has agreed to direct it and the script is in writing. When the first version of the script was completed, both Hsu and Lee were not satisfied. Now the script is being re-written. Ang Lee can't just wait for this one to complete without doing other movies. His new movie ("Hulk") is going on production soon. Hsu says they will be very cautious on the planning of the prequel and won't rush. - More news for The Touch. - Official trailers of Police Story III: Supercop, The Heroic Trio, Executioners and Wonder Seven. Thanks to BAM! - Aythe has created a Newsgroup for Michelle. Some news, articles and photos have been posted. In Chinese and English. Happy New Year - 2002 !! !